The mixed double competition is limited to 32 teams. EuroPadel and Padel4U2 members will participate at preferential rates. Contact info@europadel.net if you are looking for a partner to team up with. Each team will play minimum three games. Everybody can join us at the Saturday evening BBQ and Party with live band. On Sunday we will serve paella and later we will organize a big tombola during the closing ceremony with great prizes. Individual tickets for the BBQ on Saturday and the Paella on Sunday will be available from the catering service on site. You may stay overnight in Ghent with EuroPadel Trophy discounted rates at the beautiful Ghent River Hotel (109€ breakfast included, regular rate is 144€ excluded breakfast) Just mention “EuroPadel” when making the reservation. Also send an e-mail to info@europadel.net confirming the payment and the players’ name, e-mail and telephone number, indicating if players are members of Europadel/Padel4U2 or not. Last day for inscription June 16th, so do not wait till the last minute. If we receive more requests than vacancies (32 couples), we will proceed on first-come first-serve basis. 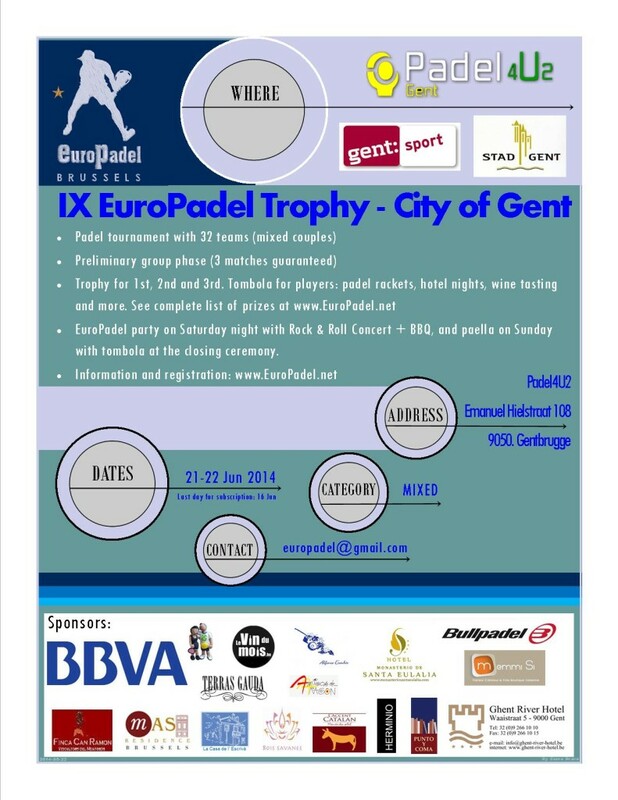 No Replies to "IX EuroPadel Trophy - City of Gent"